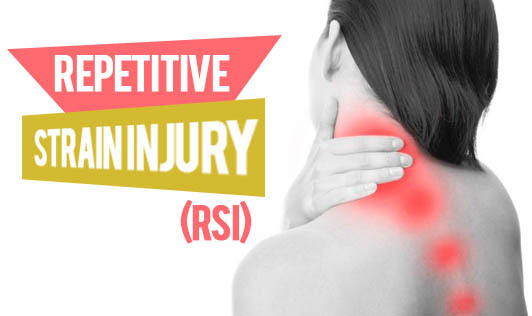 Repetitive strain injury occurs when muscles and/or nerves become inflamed or irritated. It is caused by performing repetitive motions, using excessive force or using extreme movements. Repetitive tasks - Small, rapid movements that are repeated over and over without proper breaks for resting (e.g. : typing, moving the mouse). Awkward sitting or standing positions - Working in an awkward position or not moving regularly. Moving heavy objects - Using force or moving heavy loads. Stiff or tight muscles in hands, wrists, fingers, forearms, elbows or shoulders. Tingling and/ or coldness in hands. Loss of coordination in hands. Make sure your work station is comfortable. Take regular breaks before pain or discomfort develops. Take time to gently stretch and exercise during those breaks. Observe your sleeping position. Don't curl up your wrists or put your arm under your head when sleeping on your side.